An online store is a good idea for any type of business. And kitchen supplies store is no exception. It is a good way to boost your client base and present kitchen supplies in the best possible way. It is also a great way to advertise your business too. And you can get profits from integrated commercials. But if you want to keep constant work without issues and attract new customers you need a professionally developed website theme. 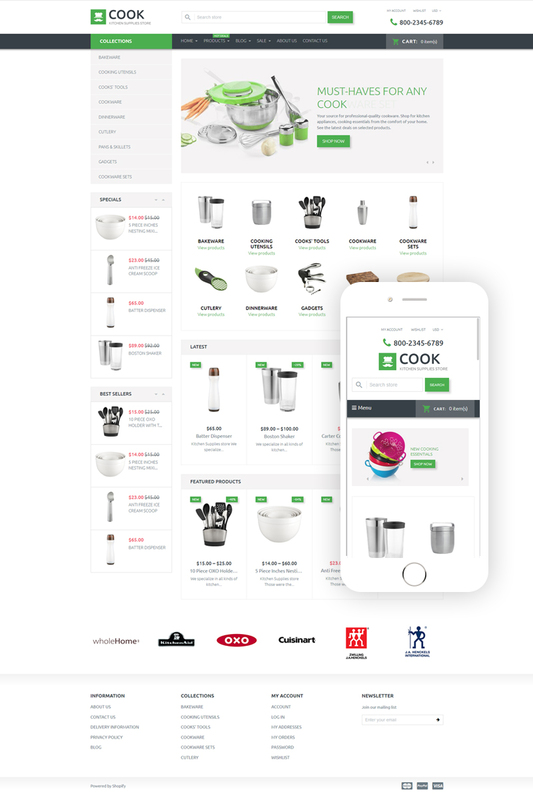 You need a Cook Shopify Theme. Developed for kitchen store it is a great tool for presenting utensils, kitchen gadgets, and cookware. It has a clean design with additional visual effects and elements. With Cook theme, you can provide customers with digital payments and currency options. It also has a cart and wishlist. It also has many pre-built pages for different kitchenware. You can blog about the latest arrivals, use a newsletter to inform customers about discount or testimonials to gather feedback. It is a great option or your business and you have to check the demo to see how good it is.